Description: This map depicts Spitsbergen/Svalbard, rather than Greneland (as stated on the map). It reflects the name given by English mariners to the island. 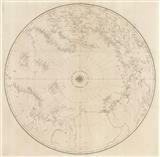 It is based on the cartography of Captain Thomas Edge. Strong impression. Description: Arctic. Polar projection map of the Arctic, made after Mercator's landmark map (c.1595) from which the geography was taken. Circluar insets of Shetland, the Faroe Islands and the imagined "Frislant". Strong impression. Description: North Polar Hemisphere. Copper-engraved miniature map of the Northern Hemisphere. Coloured. Description: North Pole. A map of the world as seen from the North Pole with two scientific digrams. Coloured. Description: North Pole. 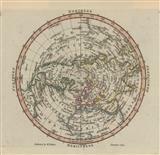 Decorative map of the world centring on the Arctic with numerous vignettes and illustrations. Coloured. Description: Captivating map of the Arctic marking exploration routes of the North-East and North-West Passages. Inset of new discoveries at Nova Zembla. Fine impression. Description: North Pole. Original colour. Framed. Description: Northern Hemisphere. Important detailed map based on the work of de L'Isle. Original colour. Description: Northern hemisphere viewed from polar projection. Original colour. Description: Detailed chart showing the track and discoveries of his majesty's ships Fury and Hecla. Part of Fax Channel, surveyed by Parry in search of a North West Passage. Description: Arctic. Unusual black and white wood engraving. Description: A map of Frobisher Strait from the journals of his voyage. Coloured. 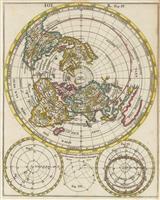 Description: Highly detailed map of the northern hemisphere. German text. Original hand colour.